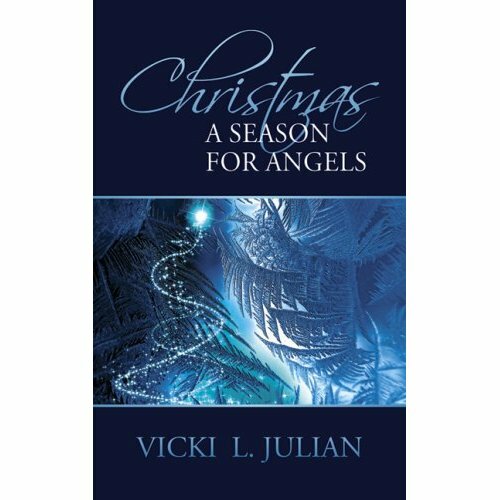 Vicki Julian is a Lawrence resident who recently wrote “Christmas: A Season for Angels,” a collection of short stories dealing with fictional people who had angels intervene in their lives. 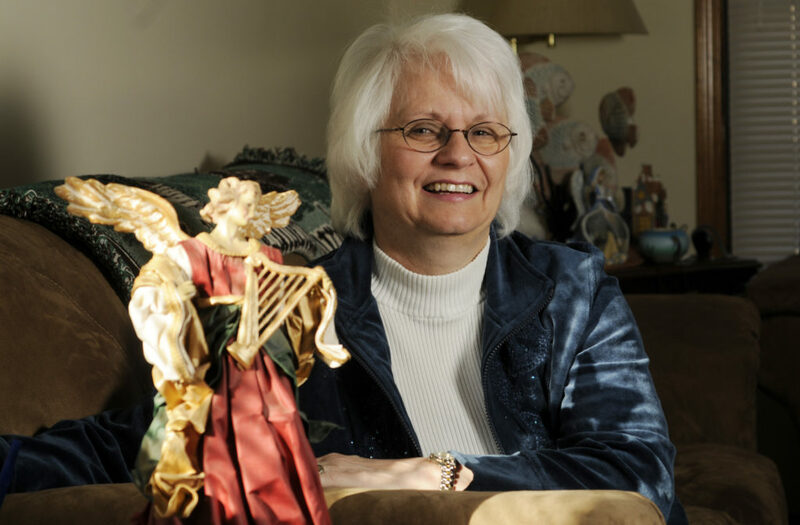 Lawrence resident Vicki Julian recently published “Christmas: A Season for Angels,” a series of fictional short stories about angels. This is one of her stories. The book (Bedside Books, $16) is available at Lawrence Memorial Hospital gift shop, The Raven Book Store, Madame Hatter’s Tea Room in Eudora and at www.vickijulian.com. To hear a podcast of Julian talking about her book, visit BoomerGirl.com. To make matters worse, if they could be, because of Steve’s cancer and her own progressing neurological issue, she had gone on disability and retired last year. Shaking her head, Leah again thought of all that she had been through: retirement, becoming a widow, selling (or at least trying to sell) the house they had built and lived in for 27 years, and recently buying another home; all this at 57 years of age. “I need something, God,” she prayed. “I miss Steve so much. Please lead me where I should be. Make me useful like I felt with Steve.” When such prayers occurred, and they occurred often, Leah found herself lost in thought. “What can I do?” was a common plea. No one really knew how many times Leah cried, or rather sobbed. In truly desperate times, she found herself writing letters to Steve on the computer. That’s what the grief workshop had taught her to do. And journal. Yes, write in it every day until there was no longer a need. That she had learned at the suggestion of a very kind nurse who suggested that as therapy for the both of them. Reading Steve’s journal over and over would always make Leah cry. She was still writing every day. “I brought you something, Baby,” was a very common statement by Steve. It might have been some candy that Leah loved, or sometimes a surprise clothing item from her favorite dress shop. There was one not far from where he commuted to work as well as the one in the town in which they lived. No matter which store, if Leah was along, Steve always delighted in encouraging her to buy more. He also could pick clothes that always fit her, and were perfect to her taste. “No, she won’t like that,” was a statement that sales clerks learned to appreciate. He was always right. Steve was also a romantic. Many other men in his office secretly cringed when they knew that he was buying flowers for Leah again. They felt guilty that they weren’t quite as thoughtful for their own wives. On the other hand, the women in his office were in awe. But all the women in Leah’s office were quick to acknowledge how they wished that their husbands were half as attentive and romantic. To everyone, it was obvious that Leah and Steve shared a special love. Together they were a team, and together they were whole. When Steve lost his battle with cancer, everyone worried about Leah. Would she be able to live on her own? Their two sons were grown and out of the house. Although they would check on their mother, they wondered: Did she need the doting attention that Dad always gave her? Friends and family were concerned. What people did not realize, Leah knew, is that it wasn’t the things Steve did for her physically, but it was what he did emotionally that really mattered. He made her laugh and he didn’t pamper her because of her illness. He made sure that she rested when needed and didn’t push, but she never gave in and neither would he let her give in. With his cancer, she did the same for him. While many people would think that their recent lives read like a Greek tragedy, they refused to live their lives like one. With Christmas approaching, Leah knew that the only way to make something of the season was to continue what she and Steve loved to do. Buying presents and doing things to serve others were what brought them the most joy. Last Christmas, Leah continued with many of their annual projects like the gingerbread creation for Big Brothers Big Sisters. Her oldest son, Chad, helped her to complete the creation that Steve had wanted to do for their seventh project, a whimsical Noah’s ark. Each year, she and Steve traded off on projects based on whatever idea the other one wanted. Steve would not see Noah’s ark (or maybe he would from heaven), but it was something they had to do. To her son and Leah’s delight and surprise, it auctioned at the highest bid for the night and took one of the prizes. This, on top of the festival dedicated to Steve’s memory. It was bittersweet, but lovely. Leah knew that she and Chad must continue to do the gingerbread festival. But thinking back to other instances when she and Steve had been a team, Leah remembered so many times when they gave to the poor, adopted a grandparent from the senior center, found just the right presents for their sons, gave to the Pastor’s Discretionary Fund and gave many other quiet and anonymous gifts to help others. She tried to do that last year, too. It was a way to honor Steve, and it kept him close to her. Of course, finding the right gifts to delight each other was another wonderful experience of the season. But unfortunately, that was one that couldn’t be continued. Giving to others, that was the true joy of Christmas, and at least, that part could be continued. Leah had had a successful career until early retirement. The stress of Steve’s cancer and her worsening disability just made working impossible. She didn’t miss her job for the three months that she traveled extensively with Steve as they tried various treatments. But as each failed and they had come to the end of the trials, Leah’s exhaustion could not be a part of it. She could not give in to it until it could no longer affect her being with Steve. Nothing would take her from his side. This last year after losing him she was learning how to cope with living alone, how to do things on her own when joint decisions had always been the norm, and how to fill a void so deep that no chasm could compare. Yes, Leah’s prayer was always the same. She needed something to be whole again, if only for a little while. So on this day of remembering and Christmas approaching, she asked herself again, “What can I do? I do love to write, but I also love to help people. I wouldn’t mind earning a little extra next year,” she grimaced. Steve had provided well for her, but still, not having to rely so much on life insurance proceeds would be a real plus. And it occurred to her. I can write comfort. And indeed she could. As Leah tried to remember what gave her the most comfort, she suddenly felt the urge to write about things of the heart. “Write about something you know,” was a common statement from her father. A lawyer, he was an excellent writer who unfortunately spent more time writing legal documents than using his gift of prose to entertain. What he did, however, was to produce one daughter who was a freelance writer, and now this one who wished to write. And just as suddenly as the idea occurred to Leah, so did the “how.” She sat at the computer and began writing. The words flowed and it was surprisingly easy. When she had finished the first few chapters, she realized how much pleasure and comfort there was for her in this task, and how much divinity there was also. The ideas, the peace and comfort with which the stories ended, the creativity, all had an origin outside of herself. She realized that God was truly working through her and she must share her work. That was the hard part. She admired and understood why it took so many years for her writer-sister to actually submit and professionally begin her career. Leah realized that your words are your thoughts, and they are a link to your soul. It is hard to be that vulnerable, but she decided to play it safely. She would first send the initial chapters to another sister and see what she thought. When the e-mail came back that it made her sister cry, and she loved it, and all the other people who read it loved it, that was more than Leah hoped for. Wait. Other people? Leah thought with a panic. And then her sister called. Leah wanted very much to also share this with her writer-sister, but was very apprehensive, too. Her sister was a professional and her opinion would carry a lot of weight. That also might be the determining factor of where this goes. I know that I have to test the waters, she thought. In fact, she sat down at the computer again and wrote for three hours on a chapter that would have special meaning for that sister. Before sending her manuscript, still in progress, Leah told her sister that she would send it only if her sister promised to provide honest feedback, either positive or negative. For almost 24 hours, Leah waited for her sister’s comments. Would she like the story that I wrote for her? Would she like the premise of angelic interventions? Would she think it was worthy of going further? And then the e-mail arrived. Her sister had loved all of the stories, and she was so moved in reading her own that she cried twice while doing so. Now it was settled. Leah had to find a way to bring the book to fruition. Her next-door neighbor was a published author and former journalist. He had an agent and also had a friend who had self-published. He agreed to serve as an initial editor. As Leah reflected on this process of writing a book that was capable of touching others and bringing comfort in the season, she realized that God had answered her frequent prayer: Steve had been her Christmas angel. He was the muse. Without him, there would have been no desire for comfort or to lessen her pain by lessening that of others. God had put Steve into her life for many things as well as being the inspiration for this book. And this, dear reader, is my story. My middle name is Leah.